MICHIGAN CITY, Ind. — A newborn baby with her umbilical cord still attached was placed inside of a safe haven box at an Indiana fire station on Sunday, and is now safe and being cared for at a local hospital. Coolspring Township Volunteer Fire Department Chief Mick Pawlik says that first responders’ pagers went off at approximately 7:05 p.m., notifying them that the box had been activated. Lt. Chuck Kohler was the first to arrive, already being in the car and on his way to the grocery store. He could hear the baby crying when he entered the station, and when he opened the door to the safe haven box, an infant was indeed inside, wrapped in a sweatshirt, umbilical cord still attached. “When I pulled the baby out of the box, my first thought was baby Grace—saving grace. It just popped into my head,” he said. Others soon also arrived and were amazed at what they saw. The baby was transported to the local hospital and is stated to be in good health. Kohler thanked the anonymous mother for doing what is right and leaving her child in a safe location. “We don’t know the situation, but to be strong enough to make this choice is wonderful. They had to choose something very hard and they chose right,” he said. This is the second time that a baby has been placed in the Coolspring Township Volunteer Fire Department safe haven box—which had just been installed in 2016—as last November, first responders likewise received an alert that the box had been activated. Chief Pawlik said at the time that he thought perhaps someone had pulled a prank, and had placed a raccoon or a doll in the box, but was amazed to see an actual child inside. Grinning from ear to ear, he stated that he felt like a “proud papa” riding in the ambulance with the infant. The child, named baby Hope by the firefighters, was placed with a family one month later and is in the process of being adopted. Monica Kelsey, the founder of Safe Haven Baby Boxes, said that she is glad that the box she had a part in installing two years ago is serving its purpose and saving lives. “There are girls who don’t want their faces seen, and we’re finding babies abandoned in woods, creeks, dumpsters—those are the babies that we are targeting with these boxes,” she told CBS Chicago. 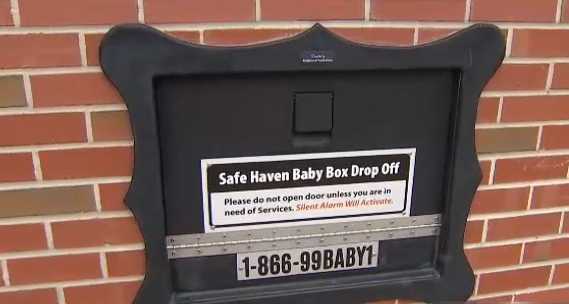 As previously reported, Kelsey’s safe haven boxes are meant to be an extension of the state’s existing safe haven law, which allows mothers to anonymously leave their babies at hospitals, police stations and firehouses within the first 30 days after birth without punishment. The boxes are similar to incubators in that they are padded, heated boxes, but also feature a device that notifies workers whenever a baby is placed inside. Emergency personnel are to remove the baby from the box within five minutes of the notification, and the child is then cared for and placed into the hands of Child Protective Services. Indiana’s safe haven law was authored by Sen. Jim Merritt, R-Indianapolis, who rejoiced at the news that another life had been saved.